I just got back from the MBA conference in DC, and it was great to meet so many people in this business. Needless to say, conversations between different bankers centered around the new rules taking effect on Jan 1. Elizabeth Warren spoke at the conference and more or less gave the boilerplate liberal take on the crisis: “It was the bankers, affordable housing targets had nothing to do with it, etc…” However, she did address QM, and said that it needs to be strengthened, because the potential liability associated with writing non-QM loans is relatively small, and in good times, lenders can compensate for these possible losses with higher rates or fees.” Clearly she is trying to discourage non-QM loans. Oh, and one other thing.. She is pushing for some sort of fair lending review as a condition to continued GNMA and FNMA MBS issuers. Something “clear and enforceable.” Which is really just wealth redistribution in drag. There is this fantasy among some people in Washington that there is this huge reservoir of great opportunities in CRA neighborhoods that are smart loans, but a bunch of stooges in the most competitive industry on the planet are studiously avoiding them because of some sort of latent racism. As if there is some big pile of money that people don’t want because it comes from the wrong zip code. Wall Street often gets it wrong, but it usually falls along the lines of seeing an opportunity where none really exists and not the other way around. Someone should tell these people that FICO and severities matter when pricing credit. The FOMC decided to keep interest rates unchanged and not to change the pace of asset purchases. After the government shutdown, virtually no one expected a taper at the October meeting. The market focused on the statement that the “Committee decided to await more evidence that progress will be sustained before adjusting the pace of its purchases.” In other words, QE4EVA is off the table. Bill Gross of PIMCO tweeted yesterday: “Think abt this Fed: Capitalism depends on carry. When carry (yld, risk spreads, etc) gets too low, capitalism stalls.” Think someone is underweight duration right now? Mortgage Servicing Rights (MSRs) are hot, hot hot. Agency REIT giant American Capital (AGNC) is buying Residential Credit Solutions, a mortgage servicer. By the way, AGNC’s third quarter earnings were pretty disappointing. They de-leveraged in a big way (ratio fell from 8.5x to 7.2x), and are now net short TBAs by 7.3 billion. Only a relatively low 130,000 jobs were added to private employers’ payrolls in October and the labor market in September was even weaker than first thought, according to the latest data from the ADP National Employment Report. That survey from the payroll processing firm and economists at Moody’s Analytics signals that “the government shutdown and debt limit brinksmanship hurt the already softening job market in October,” Moody’s chief economist Mark Zandi says in the report. Evidence that the job market was already stumbling includes a revision to ADP’s estimate for September. A month ago, it estimated that private employers had added 166,000 jobs to their payrolls that month. Now, it says there were only 145,000 more jobs than in August. The past two months’ gains are tiny in comparison to the size of the nation’s civilian labor force: nearly 156 million. The ADP report is something of a barometer for the also widely watched monthly employment report issued by the Bureau of Labor Statistics. That agency’s estimates of the October unemployment rate and payroll growth during the month won’t be released until Nov. 8. — BLS says consumer prices rose just 0.2 percent in September from August. Over the past year, prices have gone up just 1.2 percent. The September consumer price index report triggers the following year’s cost-of-living adjustment in Social Security benefits. Next year’s increase: 1.5 percent. — Federal Reserve policymakers finish up a two-day meeting in Washington, and at 2 p.m. ET are scheduled to issue their latest statement about the health of the economy and their plans going forward. Financial markets have rallied in recent days on the expectation that the Fed will not begin scaling back its efforts to boost the economy by purchasing billions of dollars worth of bonds each month. After the 2 p.m. announcement, Fed Chairman Ben Bernanke is scheduled to take questions from reporters. The latest CoreLogic Market Pulse is out. They discuss mortgage fraud, negative equity, foreclosures, and home prices. The key metric of affordability – the price to income ratio – has been creeping up, but is still around historical averages, meaning housing in no longer dirt cheap, but is still reasonably priced compared to historical standards, not just the bubble years. It is looking like some sort of grand bargain isn’t going to happen as we approach the budget negotiations. Democrats want to get rid of the sequester. Republicans are willing to replace the sequestration cuts with other cuts, particularly in Medicare and and other long-term expenses like Federal retirement. Tax hikes are a non-starter. Republicans are probably not anxious to re-live the shutdown either, so we probably get some sort of extension of the CR and the debt ceiling without much in the way of attacking spending. The Morning Report will be on hiatus early next week as I will be in DC for the Mortgage Bankers Conference. Hope to see some of you there. Finally, what if Facebook was around from WWI to WWII? Markes are higher this morning after a slew of generally positive earnings reports, most notably PulteGroup, Ford, and Coca Cola. Initial Jobless Claims came in higher than expected. California is still working through its claims backlog, so that number is probably understated. Bonds and MBS are up small. Homebuilder PulteGroup announced third quarter earnings that topped analyst estimates. New orders were down 17%. On the conference call, they noted that “housing market conditions have changed”, as demand is slowing on higher prices and mortgage rates. Their Washington DC markets, particularly the higher priced markets, were affected by uncertainty over the government shutdown. California is also “softer.” However, they view this as short-lived within a sustained, multiyear housing recovery. Tellingly though, they bought back stock and debt instead of re-investing idle cash back in the business. Bank of America was found guilty for Countrywide’s sins and the government wants $850 billion, stemming from a plan to pay LO’s bonuses on volume. The person who led the plan (dubbed the hustle) may be personally liable for fraud. Damages have yet to be determined. I wonder how much the government “encouraged” BOA to buy Countrywide. In every financial crisis, the first thing any government does is it to force shotgun weddings between the strong and the weak. Lender Processing Services “First Look” Mortgage Report has delinquencies up slightly (4.2%) month over month, but still down 12.6% year over year. Cash sales accounted for 49% of all residential sales in September, up from a revised 40% in August according to RealtyTrac. Last year, cash sales were 30% of all residential sales. Short sales accounted for 15% of all sales. REO sales were 10%. RealtyTrac estimates the median price was 174,000, which is vastly different than NAR’s estimate of the median home price which is 199,000. Markets are lower on an earnings miss from Caterpillar. Import prices rose .2% month-over-month. Bonds and MBS are up small. Mortgage Applications fell .6% last week, which is surprising given that rates fell so much later in the week. 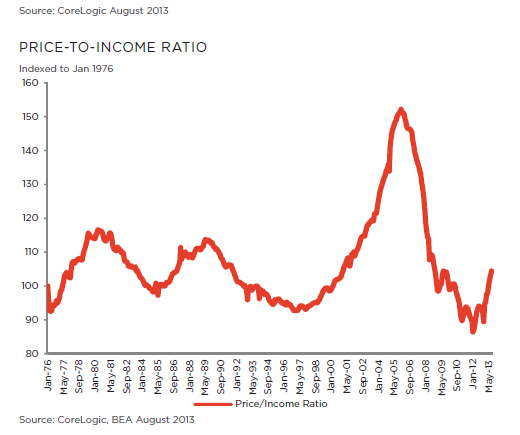 The refi index actually fell while the Bankrate 30 year fixed rate mortgage fell 5 basis points to 4.23%. The purchase index was up small. The FHFA Home Price index rose .3% month-over-month in August, which was lower than expected. Prices are up 8.5% year-over-year. The FHFA index only looks at houses with conforming mortgages, so it is a bit of a central tendency index in that it ignores the jumbos and the cash sales (which are usually distressed sales). 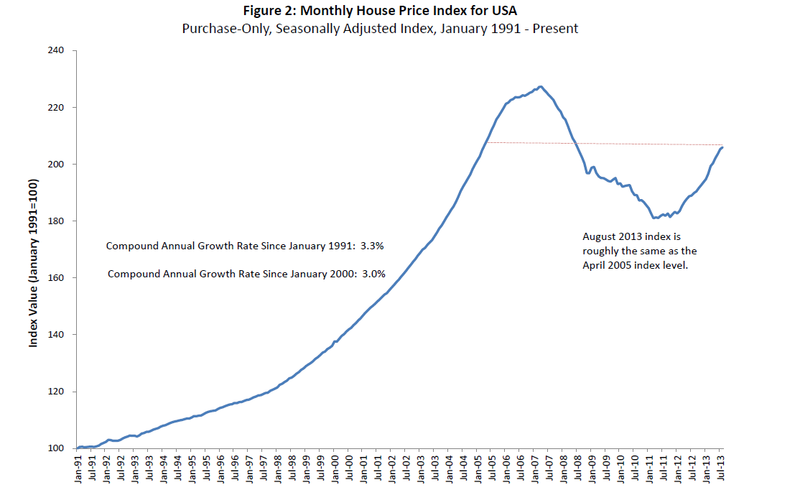 The FHFA index shows the strongest recovery in home prices of all the indices out there. Regulators gave originators a bit of breathing room by saying that originators that focus only on QM loans will not have EEOC issues if they choose to go this route. Of course that can easily change if they find that loans are not getting made in certain areas, so I would take that assurance with a grain of salt. Now that the points / fee caps pretty much make sub-$100k loans uneconomic, lets see how the Administration reacts when credit dries up at the lower price points. You think Eric Holder is going to care that CFPB made these loans money-losers? Me neither. Flagstar Bank reported better than expected earnings this morning, although mortgage origination suffered. Total originations declined 28.9% to $7.7 billion from $10.9 billion in Q2 and $14.5 billion in Q312. Purchase activity was up 17% though. Gain on sale margin fell to 1.14% from 1.47% based on “lower hedge performance.” This is surprising given that the 30 year fixed rate mortgage started the quarter at 4.39% and ended it at 4.33%. Volatility is what kills mortgage pipeline hedging and Q3 was a bit more volatile than Q2, but not by much. Surprising result. They also made no bulk MSR sales in Q3, after having made them in Q2. Given that MSR valuations have been going up, it is surprising they haven’t been ringing the register. Perhaps they are done with their Basel III MSR selling. One of the unintended consequences of taper-talk has been the slowing of the private label market. Lewis Ranieri’s (of Liar’s Poker fame) Shellpoint Partners pulled a jumbo bond deal after finding it could get better pricing by selling the loans outright. Investors are shunning the bonds because they are afraid that they will be holding long-duration / low yielding assets for a long time.